When you eat, most of the food is turned into glucose, a form of sugar, which enters the bloodstream. If you choose foods that cause your blood glucose to rise too high, and it remains high over time, health problems may develop. By making healthy food choices, you can bring your blood glucose into a healthy range and keep it there. Healthy eating can help you lose weight or maintain a healthy weight, which can also improve your blood glucose and reduce the complications of diabetes, like heart disease, kidney disease and eye disease. And, if you exercise regularly along with making healthy food choices, you may find you need less medication. So what are these healthful food choices? Everyone can benefit from choosing from a wide variety of fresh, unprocessed foods, like: whole grains, pastas, beans, lentils, fruits, vegetables, fat-free or low-fat milk and cheeses, and lean meats. But making these changes isn't easy. Take some time now to think about your lifestyle, and diabetes management, and how the food choices you make fit into your management plan. Is there a place in your lifestyle where you can focus on making small changes to help bring your blood glucose into a healthy range? 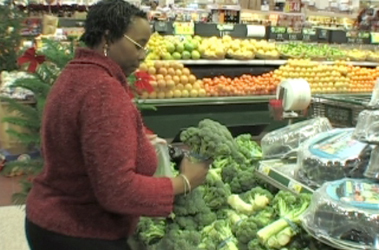 If you are unsure about how to make healthy food choices, meet with a registered dietitian. A registered dietitian can help you learn what foods are healthier than others and give you some tips and tricks to help make healthy eating a part of your life. To see how your food choices affect your diabetes, you need to monitor your blood glucose. It's the only way to know whether your food choices are benefiting you. You and your diabetes care team can decide when you should be checking your blood glucose, and how often. Write down the results of each test and share them with your healthcare provider. Healthy food choices will affect your blood glucose results in a positive way. Once you learn about the endless possibilities of delicious, healthy foods, you'll grab a spoon, fork, chopsticks & whatever it takes to start eating for your diabetes health.